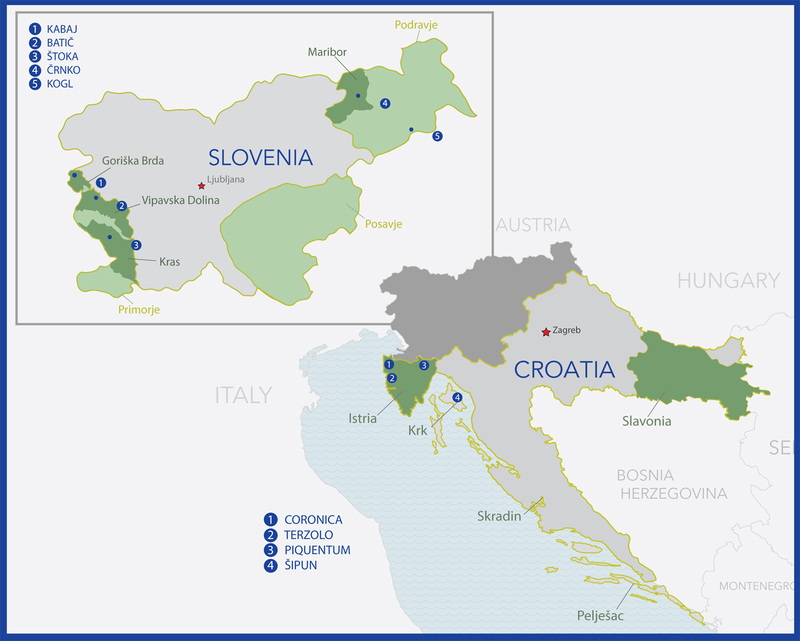 Politically, Croatia and Slovenia are at odds with each other. But wine-wise, they share a lot -- some of which Croatia will have to give up when it joins the European Union on July 1. Both countries are known mostly for aromatic white wine, but like the nearby Alto Adige region of Italy, they also make reds. The history of Croatia and Slovenia has been intertwined with neighboring Italy and Austria for centuries, as both were often part of the same larger country (Austria-Hungary; Yugoslavia). Grapes in the area sometimes have names in four different languages. That's a battleground now. Slovenia joined the EU in 2004 and its wineries immediately and successfully petitioned to own the name Teran, a red grape. You'd think this wouldn't be a problem, but EU bureaucrats don't really understand wine. Italians had to stop calling one of their grapes "Tocai Friulano" to avoid a conflict with Hungary's Tokaji dessert wines. Isn't this the same? Well, no. Italian wineries apparently actually did rename a local grape after the famous Hungarian wine to sell it. In this case, Teran in Slovenia and Croatia is actually the same thing, grown a few kilometers apart. It's like saying the word "banana" can only be used for fruit from one country. We don't know yet what the Croatians will do. But the good side of joining the EU is that they should have more market access for their wines. And they're worth seeking out. Croatia is best known to American wine lovers as the birthplace of Zinfandel, but wines made from it are actually rare there. It's better to look for Malvasia and Teran. The great thing about many of these wines is their -- how else to put it? -- honesty and passion. If you find a Croatian or Slovenian wine on a US wine list, you can bet it's not because the Wine Advocate confused it with Barossa Shiraz. Krk is the largest island in the Adriatic Sea (it's about 5 times as big as Santorini in Greece, yes I know, different sea). It's connected to the Croatian mainland by a bridge, has an oil terminal and a petrochemical plant, but is also a popular tourist destination. It's considered a center of Croatian culture and once had 25,000 hectares of vineyards, but today there's just 250, about 95% of it planted to the native Žlahtina grape. The advantage of growing Žlahtina in a warm climate is that it doesn't get very alcoholic; this wine is just 12.1% alcohol. Winemaker Ivica Dobrinčić (the guy in the photo at the top) matures it in acacia barrels, and you can tell: you get herbal acacia notes in the sea-breezy aroma. The initial taste is of salted citrus fruit, with some acacia on the finish. There's a lot of character for a light, refreshing wine. Moreno Coronica's vines are close to the sea, and you can taste it: this wine is so salty, it's almost thirst-inducing. You'd never guess this wine is Malvasia, which can be floral in other renditions, though there is some yellow plum fruit here. I'd love to try it with oysters. This is one of the wines that will have to be renamed when Croatia joins the EU. Coronica ages this wine in French oak barriques, which is still unusual in Croatia, though it may become more common as the economy improves. I didn't love the effect on the Malvasia, but with the Teran it leads to a rich, smooth wine with dark fruit and a long finish. It still has some of Teran's spiciness and characteristic iron notes; it's as if Teran has put on a suit and tie. A lot of people think Refosco and Teran are the same grape. This is a complicated issue. Wine geneticist José Vouillamoz says in the book "Wine Grapes" that Teran is genetically identical to the grape called Refosco on Istria, but that's different from (though related to) the better-known Refosco from northern Italy. Piquentum winemaker Dimitri Brečević believes they're different, and he makes these two wines to try to prove it. 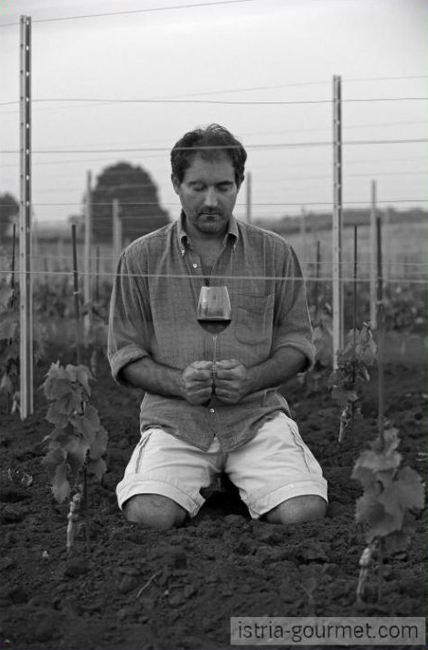 To me, he fails in that quest, but he does succeed in making two delicious wines. Brečević is unusual in Croatia in a number of ways. His father is Croatian, but his mother is French and he was born, raised, and studied enology there. He's one of the few farmers in Croatia to work organically. 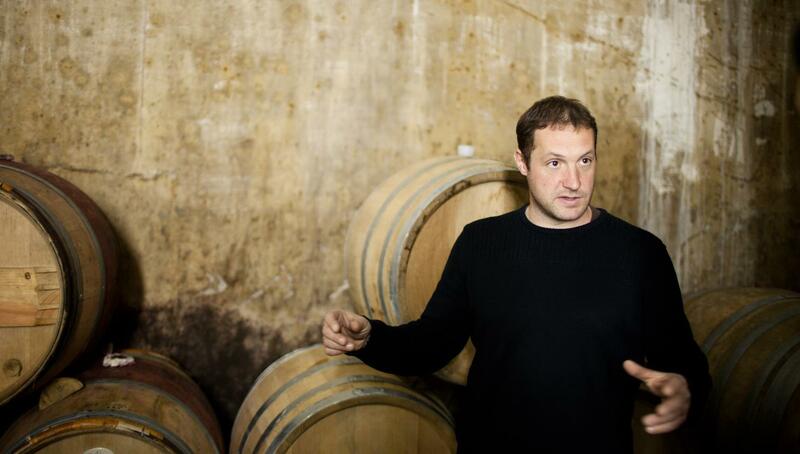 The country has been isolated from the rest of the wine world, but Brečević is up on current French thinking. That includes doing wacky stuff. Brečević hangs legs of raw ham that he's curing into whatever the Croatians will have to call prosciutto, once they join the EU, over the open fermentation tanks during fermentation. Why waste all that heat and CO2? I don't know that the wines taste like prosciutto, but they do have some nice savoriness. The two Refosco/Teran wines come from different vineyards with different soils, and they're more similar than not: light-bodied, spicy, with iron notes. I prefer the Rouge, which is what Brečević says is Teran. He won't have to rename it because the French haven't demanded that nobody else use "rouge;" in fact, they're probably trying to figure out how to make everyone use it. The Rouge is more spicy on the nose, with just-ripe cherry fruit, savory notes, a gravelly mouthfeel and a good clean finish. The Terre, from what he calls Refosco, has less spiciness, more juiciness, and stronger tannins on the finish. Is that the clonal variation, or the white soils? Or microclimate? Questions like these are why we love wine. Made all in stainless steel, this is an intense white wine that demands your attention. It's very fragrant, floral initially, with plenty of white peach flavor, a slight sea-breeze note, and great freshness. 13.5% alcohol. In folk medicine, people on Istria used Teran-based wines to treat anemia. Modern research has shown it to be high in iron, which is not surprising because it tastes like it. This wine is almost chewy, with an iron-filings feel to it until its clean, dark-cherry finish. It's mostly savory, but there is plenty of fruit. This is another wine that will need to be renamed. Franci Cvetko makes a dozen single-variety wines from the vines he has planted on his farm, but this big kitchen-sink blend is what most people in the area like to drink. I can see why: it's lively, complex and light-bodied, an easy sipper that's never boring. Riesling, Sauvignon Blanc and Chardonnay are three of the grapes that go into it, but Cvetko also has planted Traminer and two varieties of Muscat, and you can smell their influence. You smell the rose petal notes and lichee and initially think it's going to be sweet, but the finish is dry. At 12% alcohol, the locals use it as a summer afternoon drink, but I'd put this 1-liter on the table at Thanksgiving. Silvo Črnko has a farm in the old-fashioned sense: he keeps livestock for meat and cheeses; chickens for eggs; fruits and vegetables for the family table. They even bake bread every day. You'd think he and his wife stepped out of the 16th century, but in fact they're both university-trained agronomists. The wine made from their vineyards is their main source of income. They grow 10 different grapes, all of them white, most of them aromatic. They make a single-vineyard Yellow Muscat, and this is their everyday wine. It's more fruit-driven than the Kogl, with a rounder mouthfeel, but it's the same idea: floral on the nose and palate, complex, lively, just 11% alcohol, made to enjoy with every food or no food. Kras might be the world's most interesting wine appellation. It's called "Carso" in Italian, and that matters because the same appellation crosses the national border. Kras-Carso is a small appellation, with just 600 hectares planted in both countries combined. This makes the "Teran" issue particularly interesting -- Italians can use the grape's name, and so can Slovenes, but not Croatians. You'd think Croatia and Slovenia had a civil war or something. The region is so windy that farmers built rock walls to hold in the iron-rich topsoil. When it blows away, they pick it off the walls and scatter it back on the farm. This wine has a nice, juicy mouthfeel, a contrast to the spicy, complex, savory flavors. There's plenty of dark cherry fruit but you're more likely to notice the iron and spice. Romance leads to interesting wineries. French winemaker Jean-Michel Morel met Katja Kabaj in Italy; they married, and he moved to Katja's family's village. Morel, a former French Legionnaire, makes his white wines in ways inspired by Georgia, and reds as he learned in Bordeaux. Perhaps it's the terroir, perhaps it's the experimentation, but his whites are much more interesting. You'll note from the vintages that he believes in aging even the whites. Sivi Pinot is the local name for Pinot Gris. Morel leaves it on the skins to get some prickle to the mouthfeel. It's an interesting wine, opening with juicy stone fruit and finishing salty. This is not your neighbor's Pinot Grigio. Rebula is the name used in Slovenia's Goriška Brda region for Ribolla Gialla, a white grape that was first mentioned in a church dispute in the year 1296. There's a reason this grape is trendy right now: It has a lot of character, and has the heartiness to stand up to interesting interpretations of it. This is one of those: an orange wine that spent a month on the skins, though in an anaerobic environment because Morel is going for complexity, not funkiness -- at least, not on this wine. It also spends two years in oak barriques. The result is a very interesting wine that's hearty and juicy, but with aromas and flavors more of nuts than dried fruit. The mouthfeel has a touch of tannin and the finish is long. This was the must-try wine among the sommeliers at the tasting I attended. 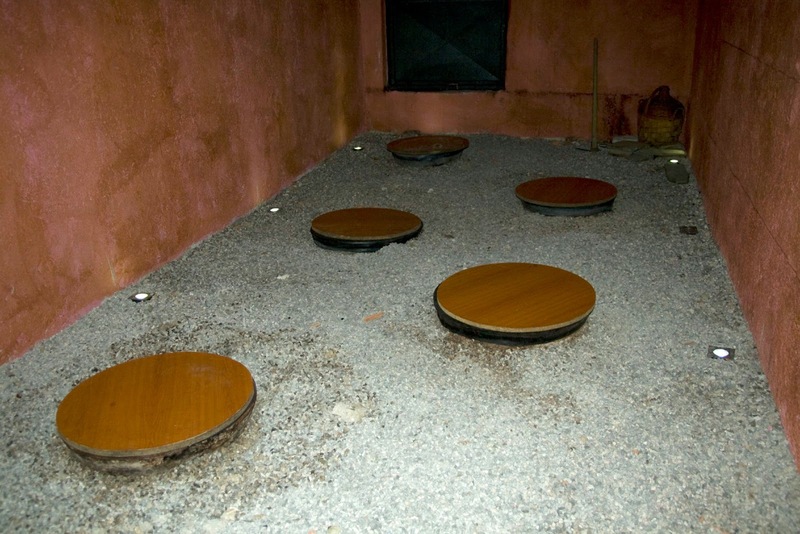 Morel uses the Georgian method of pouring the grapes, skins and all, into a 3500-liter amphora buried underground. He punches down the cap during fermentation, but when fermentation is done he seals it and leaves it alone for 10 months. Morel ferments three varieties -- Rebula, Malvasia and Fruilano -- in separate amphora; this wine is a blend of about 60% Rebula. I could smell it all day: it's nutty and earthy, with fig and raisin aromas, and more there each time you go back to it. The mouthfeel starts juicy and goes sandy, as it's completely dry on the palate. It's a wine geek's wine to be sure, with flavors as good as the story. There are two types of people making orange wines. Young winemakers who think it's trendy are the majority. Ivan Batič is the other type. He forbade his son Miha from going to enology school because he thought it would cloud his brain. This wine is a full-on, old-style, primitive, orange wine. The Batičs grow three local varieties -- Rebula, Pinela and the rare grape Zelen -- side by side in the same vineyard. They harvest them together and ferment them in large open-top oak vats until the wine is completely dry. They bottle it unfiltered, and you can tell because it's cloudy. It's very aromatic, smelling almost as much like artisanal apple cider as wine. I noticed fresh and dried apples, dried peaches and herbs. The mouthfeel has plenty of texture, and there are nutty notes along with dried apple on the long, juicy finish. A terrific wine. Red wines aren't the strength in this part of the world, but this Cabernet Franc would appeal to Loire red fans, even though it would not be mistaken for one of those. There's a meatiness to the mouthfeel, with pretty strawberry notes on the nose and tangy, savory flavors. A dessert wine made by leaving late-harvested white grapes (Pinela and Rebula) to dry for six months in a windy loft until the following Easter, when they are pressed. It takes 30 liters of grapes to make 1 liter of this wine. The flavor starts off with green walnuts, then goes through an ashy stage before finishing with cashews. It's a long, complex wine with a rich mouthfeel, and though you can tell it's fairly sweet, there is so much else going on that the sweetness isn't what you concentrate on. My favorite of the two versions of this. Made from dried Cabernet Franc and Merlot grapes, this dessert wine tastes notably sweeter than the Bianco, with notes of raisins and dried cranberries. It's also fruitier and more straightforward than the Bianco, and I can see the appeal of that. Most of these wines can be ordered directly from the Blue Danube website. * This is a sponsored post, but not an advertorial: for the distinction, click here. In addition, the winemakers I spoke to in Istria insist that THEIR Teran is NOT the same grape as the Teran you find in the border region of Slovenia around Trieste. Waynegrape: "Nearby" is not "neighbouring." In matters of grape identity, I defer to geneticists over winemakers. Yep, I agree with Waynegrape - not sure where that AA comparison came in. To say "Croatia also makes reds" is like saying that BMW also makes motorbikes (you yourself mention Zinfandel in paragraphs below, anyway). Teran is an Istrian (Croatian) grape. What Slovenians call Teran is wine made of Refosco grapes. And it has been scientifically proven that the two are different varieties. So, Teran in Croatia and Slovenia are NOT the same things. Additionally, it is not "unusual" to age wine in French barriques. Why would you say this? I don't think that Slovenia and Croatia are politically at odds. They have issues, but wouldn't say they're at odds. "Somm" review: The best wine documentary yet? Sample Europe's food culture in two hours! How common is sexism in the wine industry?